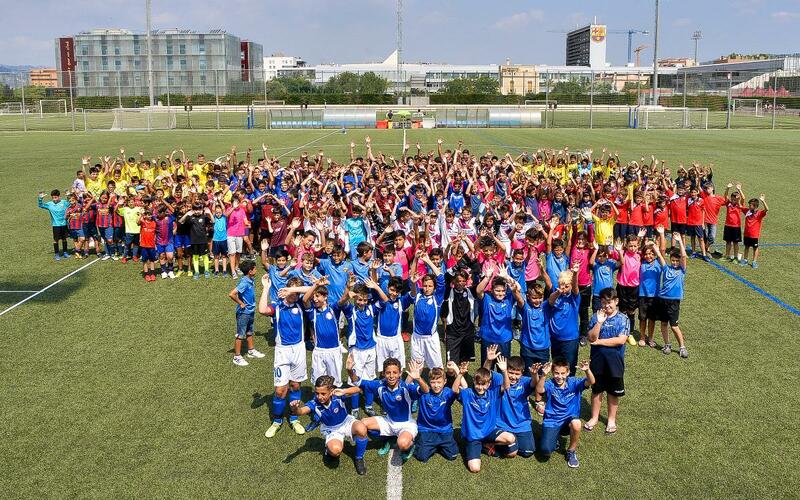 The FC Barcelona supporters group association, the Agrupació de Clubs i Penyes, organised the finals of its tournament on July 7 at the Ciutat Esportiva Joan Gamper. Some twenty teams in the Under-10, Under-12 and Under-14 categories closed the season amidst a great atmosphere. Starting off the day was Under-10s competition, with games involving the PB Vallirana, PB Sant Vicenç Horts, APB Anguera, CB Terlenka, PB Castellbisbal, PB Ramón Llorens, PB Cervelló, PB Sant Cugat del Vallès, PB Trinitat Vella, PB Cinc Copes, PB St. Feliu de Llobregat, PB Villaverde, PB Sant Just Trajana and PB La Roca del Vallès supporters groups. The final of this category was won by UB Catalonia against ADB Collblanc. At midday, the two winners of the Under-12s competition were decided. CB Terlenka were the victors in Group 1 and PB Sant Just Trajana in Group 2. Finally, the winners’ trophy in the Under-14s category went to APB Anguera, who beat PB Cinc Copes. The trophies were presented by Agrupació de Penyes president Lluís Monràs, FC Barcelona Social Commission head of supporters groups, Daniel Sala, and former player Paco Clos. FC Barcelona board member Pau Vilanova also attended the finals.